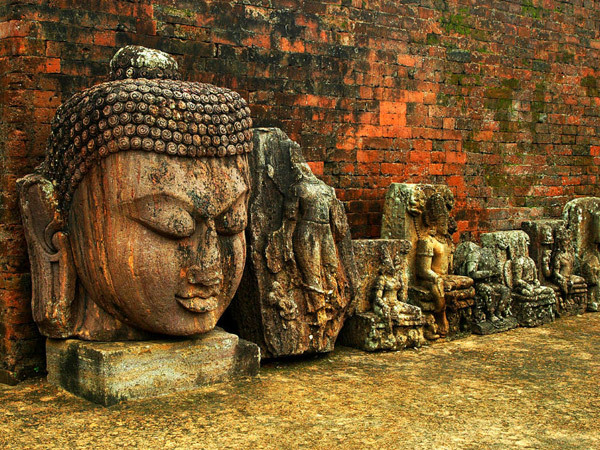 Buddhism is found in the state of Odisha, since the time of its inception. Although Buddha never visited the land during his lifetime, Hiuen Tsang, the celebrated Chinese traveller in the 7th century, wrote about how flourishing Buddhism was in Odra, the present Odisha. Between the 8th and 10th centuries, Buddhism was the state religion under the rule of the Bhaumakaras and during this period, there was the evolution of the tantric form of Buddhism. The influence of Buddhism in Odisha continued until the 15th century. During these periods countless stupas and monasteries were built, which have been found across the state of Odisha, which speak volumes about the long heritage of the religion. Have a look at some of the ancient Buddhist sites found in the state and be mesmerised by the rich heritage they showcase. The Langudi Hill is believed to be the place where the Buddhist monks met Emperor Ashoka the Great. which was one of the major events responsible for his transformation. Unlike other sites, this place has a large number of stone inscriptions which are believed to be written and installed by the emperor himself. The most important feature here is the rock-cut stupas and sculptures. One would come across the ruins of a monastery, terracotta figures, seals and different types of broken pottery, which have been unearthed from here. Udayagiri is situated in the basin of a U-shaped hill. The site hosts the remains of a huge monastic complex, a brick stupa, two brick monasteries, a massive shrine complex along with a stepped well and a large number of rock-cut sculptures. The monastic complex was excavated sometime during the years 1997-2000. The complex has a large courtyard, a huge statue of Buddha in a seated posture, 13 cells, a secret chamber, a brick water reservoir and evidences of an upper shrine chamber. The inscriptions and architectural style found here proves that the monastery was at its peak between the 7th and 12th centuries AD. Ratnagiri plays an important role in the birth of Tantric Buddhism and the Kalachakra Tantra during the 8th to 10th centuries AD. Tantric form of Buddhism is said to have millions of followers across Mongolia, Tibet and the Himalayan regions of India. Evidences found at the site says that Odisha was the birthplace of Tantric Buddhism from where it spread to the rest of the country. One can find two large beautiful monasteries which have countless sculptures along with a large number of votive stupas. The construction of the structures is believed to have begun in the 6th century AD and flourished as an important centre of Mahayana Buddhism until the 12th century AD. The highlight of one of the excavated monasteries is the delicate carvings at the entrance of the structure and 24 odd colossal heads of Buddha in various sizes. Situated 90 km away from the capital city of Bhubaneswar, is Lalitgiri which is the oldest Buddhist complex in the state, which dates back to the 1st century AD. The most important structure which was excavated here was a huge monastery constructed out of bricks, remains of a prayer hall and a stone stupa, which was renovated. In the year 1985, during excavation, caskets made of gold were found from a stone stupa which housed sacred bone relics which are believed to be that of Buddha himself.